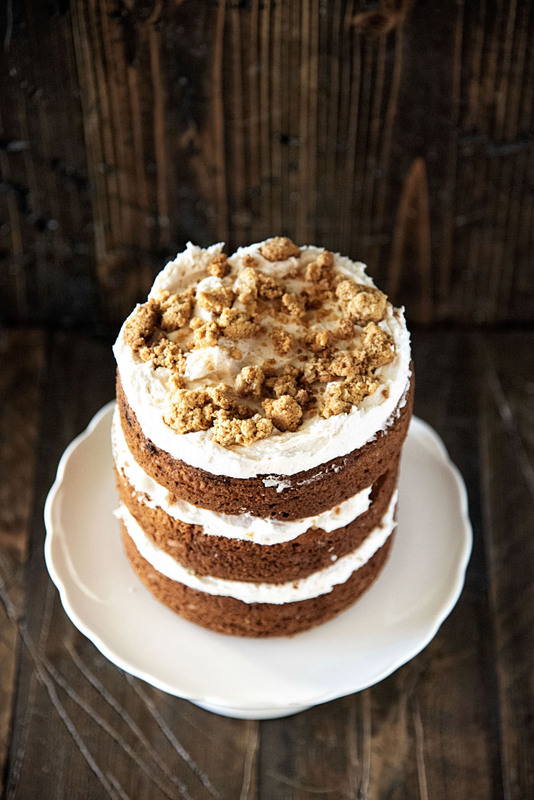 Oatmeal Cream Pie Cake: Thick layers of oatmeal brown sugar cake layered with creamy marshmallow filling all topped with oatmeal cookie crumbles. It’s National Oatmeal Cookie Day. The cookie I think gets overlooked and shouldn’t. Part of it is because people have issues with raisins in cookies. I love me some Oatmeal Raisin Cookies. I really love me some Oatmeal Chocolate Chip Cookies. And I loved Oatmeal Cream Pies as a kid. 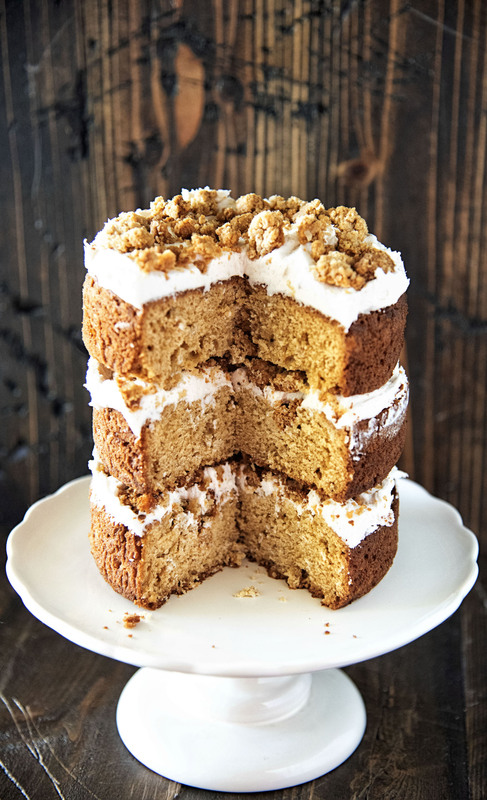 I had seen a recipe for Oatmeal Cookie Cake in Tessa Huff cookbook Layered. While the original cake had an oatmeal raisin filling I decided I would pay tribute to the Oatmeal Cream Pie. So the cake stayed mostly the same though I added oatmeal and omitted some ingredients. But I added the marshmallow filling. Don’t use butter instead of shortening on the filling…it does not taste the same. You will have a ton of crumbles left but don’t toss them out! They are fantastic on ice cream! Grease and flour three 6 inch pans and set aside. Sift together the flour, oatmeal, baking powder, baking soda, and salt set aside. At the sugars and mix on medium high until the butter is light and fluffy, about three minutes. The mixer to medium low and add the molasses, vanilla, and the eggs and egg yolks, one at a time until combined. Stop mixer and scrape down the bowl. Turn the mixer to low and add the flour mixture in three batches, alternating with the buttermilk, beginning and ending with the flour mixture. Mix on medium for no more than 30 seconds after the last streaks of dry ingredients are combined. Evenly divided the batter between the prepared pan. 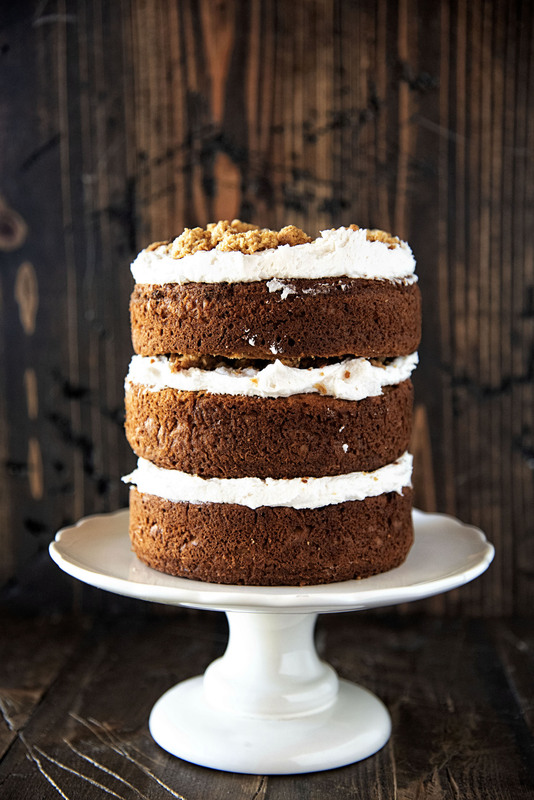 Bake for 30 to 35 minutes or until a toothpick inserted into the center of the cakes comes out clean. Let them cool on wire rack for 10 to 15 minutes before removing the cakes from their pans. Keep the oven at 350F for the crumbles. Mix together the cookie mix and melted butter. Mix with your hands until crumbles form. Spread out the mixture onto a baking pan lined with parchment paper. Then flip the crumbles with a spatula and bake another 5-10 minutes depending how crunchy you want your crumbles to be. You will have extra crumbles. They are great on ice cream. Cream the shortening, powdered sugar, and vanilla together until smooth. Add the marshmallow fluff and mix until fully combined. Place a cake layer on a cake pan. Take 1/3 of the filling and spread it on top of the layer. Add 1/2 cup of crumbles. Repeat until all the filling and cake layers are gone. 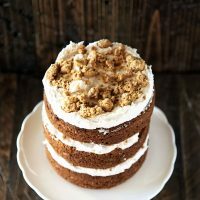 We tried this cake and we LOVED it! My biggest “problem”….too much of the delicious crumbles left over. I’ve been munching on those as if they were granola. Our entire family loved this cake. It will go into our rotation dessert file.